Jussie Smollett case: All the questions we need answered, and why his career is still "over"
Prosecutors claim he has not been exonerated and has accepted community service. Defense attorneys, however, claim his record has been wiped clean of the charges against him. 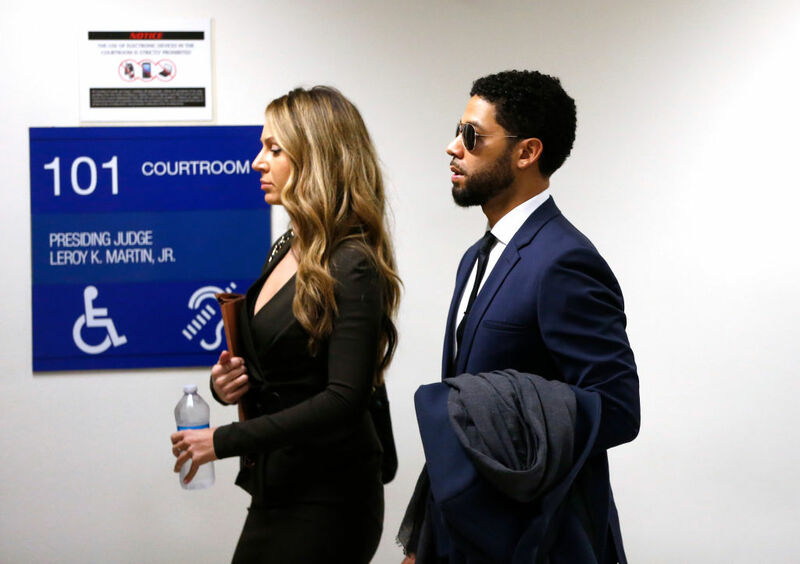 On Tuesday, the prosecutors in the Jussie Smollett case suddenly dropped charges against the 'Empire' actor. He was accused of lying to the police about being the victim of a racist and homophobic attack, and on February 14 the actor had pleaded not guilty. The prosecutors' decision came as a surprise to many, especially the mayor of Chicago and the police department, and the fact that the charges were dropped without citing specific reasons has further increased speculations surrounding the case and what really happened. The defense attorney's statement to the press was, "Today, all criminal charges against Jussie Smollett were dropped and his record has been wiped clean of the filing of this tragic complaint against him. Jussie was attacked by two people he was unable to identify on January 29. He was a victim who was vilified and made to appear as a perpetrator as a result of false and inappropriate remarks made to the public causing an inappropriate rush to judgment." Police's investigation shifted after they spoke to the brothers who allegedly attacked Smollett. Brothers Abimbola “Abel” Osundairo and Olabinjo “Ola” Osundairo claimed that they were paid $3,500 to stage the attack. It was also reported that one of them was also cast as a side character on 'Empire' proving prior relationship with the actor. These facts added to the absence of a record of the attack resulted in Smollett being booked on charges of lying to police about being the victim of a racist and homophobic attack on February 21. The prosecutors who dropped the charges had not stressed Smollett for an apology further indicating the actor will not be held responsible for the charges that were filed against him. This resulted in a heavy backlash against the prosecutors who had dropped the charges. Police Superintendent Eddie Johnson felt that Chicago "is still owed an apology,” and added, "I’ve heard that they wanted their day in court with TV cameras so that America could know the truth. They chose to hide behind secrecy and broker a deal to circumvent the judicial system." Johnson made this statement at a graduation ceremony for new police cadets. Tandra Simonton called it “a just disposition and appropriate resolution” but said it was not an exoneration. This is contradictory to Smollett's attorney's claims of his record being "wiped clean." Magats also added, "that prosecutors dropped the case because Smollett forfeited a $10,000 bond payment and did community service." He further confirmed that the prosecutors needed to concentrate more on violent crimes in Chicago. What is problematic here is how the prosecutors have gone against precedence set in such cases where the charges are dropped. With no official statement of apology, the step taken by the prosecutors doesn't reflect well on the police department and the city. Mayor Rahm Emanuel's response to this decision also stems from the fact that dropping charges questions the credibility of the police department. He said, "This is a whitewash of justice. Where is the accountability in the system? You cannot have, because of a person’s position, one set of rules apply to them and another set of rules apply to everybody else." People who have been following the proceedings have one burning question. Why did the prosecutors really drop the charges? Bo Dietl, founder and chairman of investigative firm Beau Dietl & Associates, said, "There are several things at play that come to mind. The veracity of the witnesses may have been called into question. It is basically 'he said-he said.' It is the word of Smollett versus the brothers. The notoriety of the case has precluded him from getting a fair trial. The level of proof needed for the police to effect an arrest is probable cause. While the DA’s office would have had to prove the charges beyond a reasonable doubt to obtain a conviction." Amid all of this, the question remains whether Smollett will be able to resurrect his career. Ron Torossian, CEO of 5W Public Relations said, "From a Public Relations perspective, I still believe Jussie Smollett’s career is over, regardless of the charges being dropped. No brand will want to be affiliated with Smollett, and no show or program will want to involve him. "Generally, in the world of crisis, there are two courts to worry about, the court of law and the court of public opinion. Despite his 'success' in the court of law, the court of public opinion decided weeks ago that they will not support him. In today’s climate, I don’t believe the public will forgive him for this. While his record will be wiped clean, his reputation will not. He is likely to be remembered solely for this incident, and I think his success in Hollywood is done." He also added, "Jussie’s reputation will never be fully restored in the public eye. He’s lucky that the courts decided in his favor. However, this whole situation was a career-halting problem which he has created."